Venue Maestro is based in Perth, Western Australia. The service is an online venue finder showcasing meeting rooms, conference venues and event venues Australia-wide. The platform connects event organisers with the perfect venue for their event. Imagine…a platform that can give you a selection of stunning venue rooms for your number of attendees, facilities and event type by a pinpointed map location, in an instant. Having worked in Perth, Western Australia for a number of years, co-founders Stephen Wigley and Andrea Deegan not only had contact with many event organisers but had first-hand experience struggling to find venues for special events they were organising. 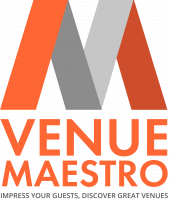 After extensively canvassing venues and event organisers; asking them what they want, understanding what they are not getting, with a goal to giving it to them, the website “Venue Maestro” was designed and delivered for the hospitality industry. It has been received with excitement from both venues, event organisers and their audiences alike. “A lot of the venues that have come onboard simply love that they have an individual page to showcase every room. It also allows users to discover rooms they may have never known of, it’s an effective tool to match an event planner’s needs with the perfect venue” says co-founder Andrea. Whether you are organising a small meeting, residential conference or a 50th birthday party. there is nothing quite as frustrating as wading through multiple venue websites and having to guess exactly what each one can offer, and whether they can cater for what you and your guests want. Yes, there is huge demand from event organisers, and it’s a functional solution that does not cost the earth for the venues. Launched in April 2018, the team’s aim is to level out the playing field by offering a platform with advanced search capabilities and stunning visuals without taking a huge cut from each event. Knowing that the hospitality industry is operating on tight margins already, they based the business on an affordable subscription model, the mission was to expose the more unique and smaller venues alongside the larger, known venues to engage audiences organising events whatever the size or budget. Taking a big-picture approach, these venues are also promoted across Venue Maestro’s social media channels. Focussing on high quality and unique venues that typically cater for business events, meetings, private celebrations and weddings, the room-by-room advanced search capability and location detection of Venue Maestro connects specific event features to a venue. The platform was developed by the local user experience web team Burning Fruit. The site is still in its infancy with many plans and enhancements to come that the team, venues and audiences are very excited about. Currently concentrating on Perth and South West venues at present, the platform will commence on-boarding interstate venues later this year. They offer a free trial period for venues and expressions of interest can be made via their website. The website seeks all stunning, impressive venues, especially ones with a twist!